At our pop-up shop back in April 2017, Fox Brothers brought up some vintage bolts to offer readers, including a rather beautiful ecru cavalry twill. I bought a length myself, and subsequently had it made up into some plain-front trousers with Pommella. Those trousers have proved very popular, with inquiries to both myself and Fox about the possibility of getting more of it. So late last year we decided to go ahead and re-weave the cloth, and I’m happy to say that a limited run is now available on the Merchant Fox website. There is only 14 metres available, so with men needing on average 1.5 metres for trousers, there will only be about 10 cuts on offer. However, Fox have been careful to make sure they have access to the yarn, so another batch can be woven relatively quickly. If you find the cloth is sold out, therefore, please follow the instructions on the Fox site to be on the list for the next batch. They will then be in touch with details. We're waiting to confirm when that next batch will be ready. There is a drop-down menu where you can select the length you require, but if you want other options (or want to ask further questions) you can email Amy Haines at amy@themerchantfox.co.uk. I love my trousers, in particular the slightly unusual double twill and the super-sharp creases it produces. And of course cream is not the most practical colour. But if you have most other colours in your wardrobe, cream is a lovely addition. It’s a way to make a statement without strong patterns or loud colours. I tend to wear mine with dark, simple colours elsewhere - in particular greys. In the image above they work well with a grey brushed-cotton shirt and brown nubuck jacket. It's all about texture and contrast of tone. And in the outfit below the combination is actually quite similar - with a charcoal rollneck on top and my brown-tweed ulster coat over it. Finally, in my piece ‘How to wear trainers’ I wore the trousers with a denim shirt (which I think works particularly well, subverting the formality of the trousers) and a navy cardigan. The lack of pattern is not coincidental. The cloth is 450/480g (16/17oz), 100% pure new wool, code FS684-C2076/11. It costs £140 a metre. I had my trousers half lined, and I’d recommend that - the wool isn’t coarse, but it’s not super-soft either. 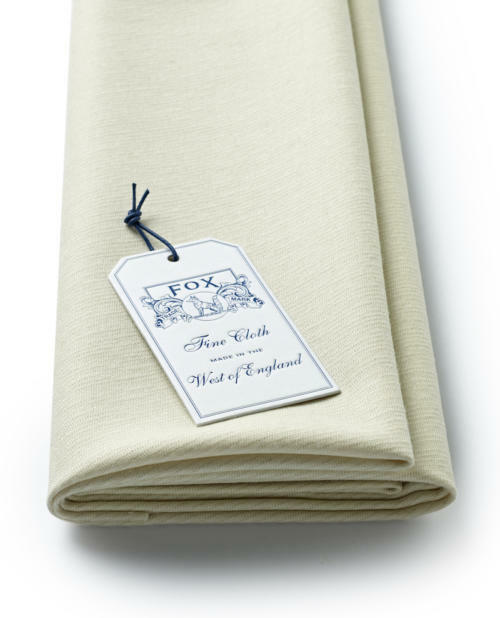 Cloth on the Merchant Fox website here. You can follow the discussion on Fox re-weave my ecru cavalry twill by entering your email address in the box below. You will then receive an email every time a new comment is added. These will also contain a link to a page where you can stop the alerts, and remove all of your related data from the site. I think when you say “cream is not the most practical colour” you really mean “cream is pretty much the least practical colour”. I have some lovely cream trousers. Experience has told me that you either accept a build up of stains over time, or use of the dry cleaner every few wears. Which, of course, means that they don’t get worn very much at all. Such is life I suppose! Stick to cricket with that colour. Beautiful fabric but overpriced: 140 pounds per meter? I noticed a huge increase of Fox pricing recently (from 92£ to 108£ for the Classic Flannel bunch). Despite their hype on the market, I don’t think it’s an clever marketing pratice and it could be counterproductive at the end. The increase generally in price is largely from the raw materials – merino has gone up a lot in recent years. As to this ecru, it is definitely expensive, but again that is largely down to the costs involved – small production of yarn, a lot of that yarn going into the cloth, setting a loom for just a small run, weaving slowly and so on. There’s no difference in margin across the cloths, merely in costs involved. I always find these discussions about price interesting, because I think consumers tend to assume a brand picks whatever price it thinks it can get away with. I certainly did when I was just a consumer. Interesting explanation. One rule nevertheless when it comes to pricing issues: always motivate the increase or the customer won’t understand why he should pay a higher price for the same product without increase on quality. Personnaly I was thinking to buy few meters of a Fox classic charcoal flannel but now I tend to explore HFW options which flannels are surely as qualitative. It’s the law of competition. To your point on HFW flannel’s quality, i agree. And a Row tailor (who shall remain nameless) told me a few years ago that HFW flannel is also woven by Fox. HFW have also increased their prices for the current bunch and Fox’s price premium over HFW is still pretty much the same, around £8 per metre. HFW have a great choice of flannel. I’ve had two pairs of trousers made from their cloth. They seem to have a better selection than Fox. I don’t think it sounds too expensive. The LL range hovers at around £120 on much longer runs. 1.5 yds should be plenty for the average build, so sub £200. And it doesnt feel expensive considering its a small run. I totally agree with Simon. Some people always assume brands are either stupid or blind. Put yourself in Fox’s shoes for a second: why in the world would they sell a cloth twice as expensive as their direct competitor’s, when their customer base is so small and 100% able to compare between options??? I’m on Fox mailing list and they announced increase of price well in advance allowing people to buy at the old price. The increase was also justified by the price of raw materials going up, which I can understand. 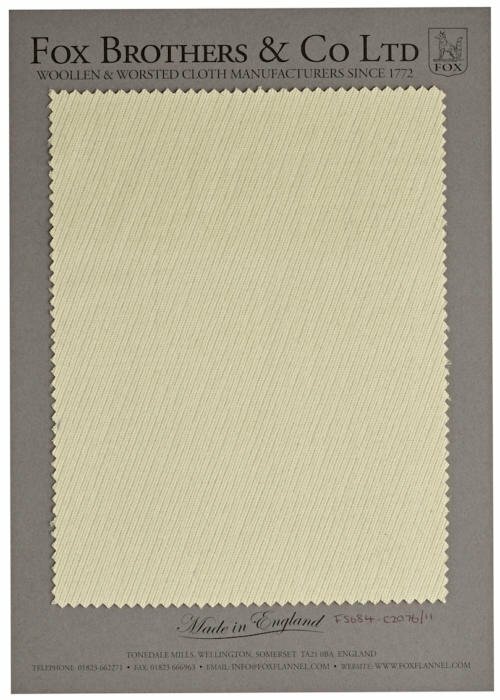 Dugdale’s have a lovely cream coloured cavalry twill in their white rose Caldonaire bunch nr. 4220. It’s a heavy cloth at 600 g/21 oz, but then cavalry twill does not wear warm. You can wear this at temperatures of up to 20-22 Celsius. And it certainly is more stain resistant than one would expect. They call it light fawn, that’s what the picture suggests too, but it’s rather a dark cream in reality. I hope this is a suitable place to ask, but what would your recommendation be for formal odd trousers around the £300-£400 mark. I’m not looking for anything stylistically special: just flat-fronted and fairly straight-legged with side adjusters. I know Rota (via Drake’s and Anderson & Sheppard) is supposed to be one of the better RTW’s, but would you look at MTM options (P. Johnson, Anglo Italian, Saman Aman’s Toscana line etc) or even entry level bespoke like Graham Browne? Rota is certainly one of the better ones, yes. But I would also look at those MTM options – less cheaper bespoke like GB, unless you find you have real fit issues with trousers generally. Always worth bearing in mind what your issues are. Eg A&S has a range of styles, and can alter the waist and leg length for you. So it’s almost like MTM. But they can’t change the rise, for instance, so if that’s an issue for you better to go for a full MTM option. I have several pairs of MTM trousers from both Saman Amel and Stòffa and I can highly recommend them both. I have two pairs of trousers from GB, one flannel and one linen, and have just ordered two more. At £280 they’re excellent value. Definitely comparable to a pair I have from A&S. I think the finish at GB noticeably improved over the last year as they moved production in-house. Thanks to everyone for all the advice. I’m actually between the first and second fittings with Russell for my first GB suit, so I will find out soon how the trousers of that are and be able to make a direct comparison. In the mean-time, is there a specific one of those (or other) MTM makers you would recommend trying first Simon? Through PS, I’ve started to understand and enjoy experimenting with jacket styles (GB will be the first English military cut) but ideally I’d like to see trousers become a bit like shirts for me – where I can stick to one style and place and order a couple of flannels every winter and high-twists every summer in a price range I’m comfortable with. I agree, that’s usually the right approach with trousers. 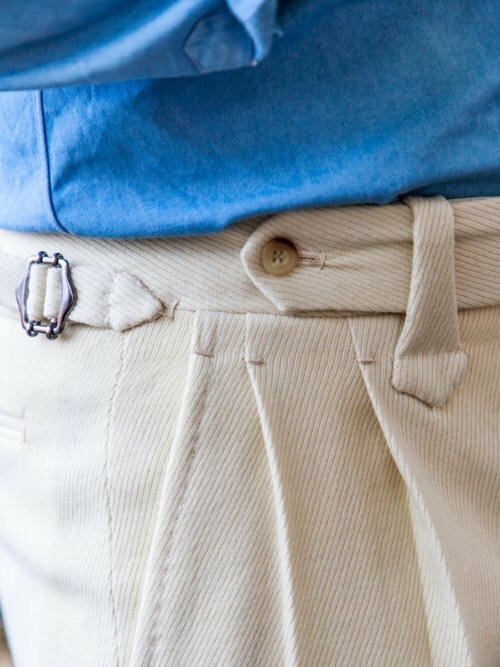 Is it wrong to consider cream and other light colors more appropriate for summer wear? This is my reaction when I see these trousers, or white trainers (sneakers) etc. That being said, I feel this reaction less for an oatmeal jacket worn in winter. I’d like to hear the views of others on this. Personally, I think it’s just a question of looking better in sunlight. So I wear paler trousers in winter, but usually on sunnier days. Good sir, might you be able to provide information on the brown overcoat pictured above? Also, unrelated, any thought regarding the Rapha Custom program that is forthcoming? Perhaps a Permanent Style x Rapha collaboration? Details on the coat here. Being both colourblind (and the general issue of colour in photos on the internet) and not being able to see any of the fabrics beforehand …. 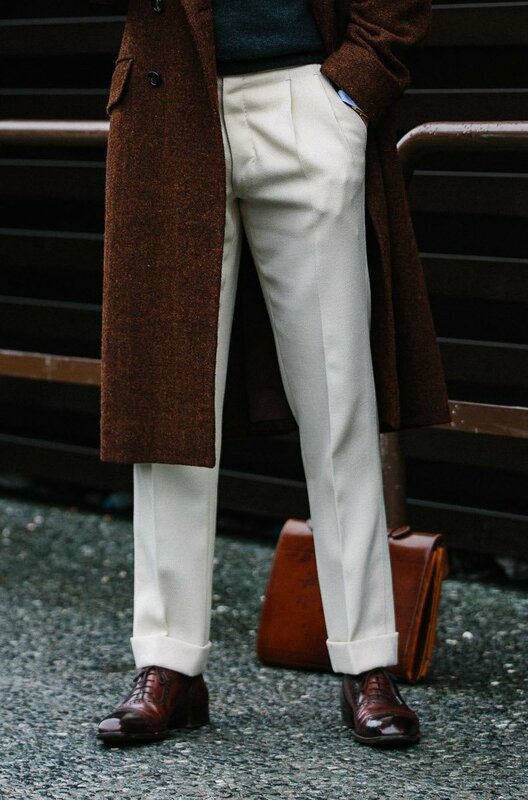 how does this fabric compare to that used for your recent Drake’s trousers? Paler. That was more a light tan, this is a cream or ecru. 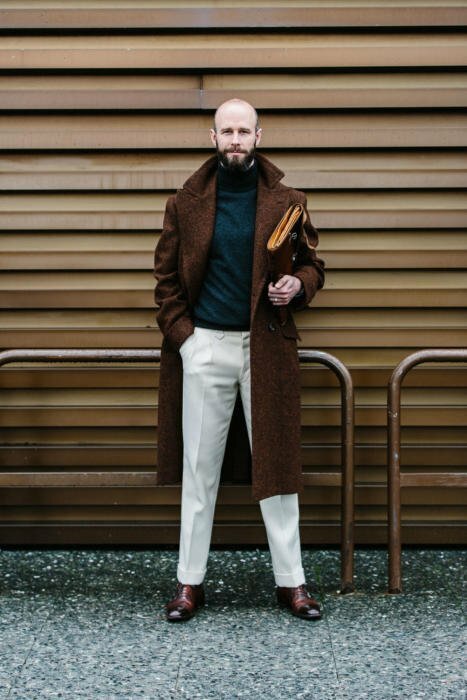 If you were to going to get a pair of trousers made in one or the other, assuming you have nothing similar at all presently and unlikely to get anything else soon…. which would you go for? What beautiful cloth! Cream may not be the most practical colour, but it is certainly a versatile one. It looks perfect up against almost anything, from navy to brown to grey to tan. Is there anything in particular that makes Fox flannel fabrics superior to its competitors? Or is Fox marketing just better than rivals? This outcome deserves a post indeed! As to the time and occasion when you might pull off your trousers, I just wonder whether you wouldn’t be fairly realistic if you relied less on sunny days in London and thought instead of evening events when they could be appropriate too. A small pernickety point so I apologise in advance but, occassionally, when describing a product you venture into the possessive ‘my ecru cavalry twill’ (vs. ‘Fox’s ecru’)…it sometimes looks ungracious or over-keen to take credit. The cloth is Fox’s and had nothing to do with you re. choice of colour or weave (unless you haven’t told us). I acknowledge that you did pick it and latterly promote it. It has been true with some collaborations where ‘my’ is oft used. Your large, loyal audience is already a convert and admires much if not all of what you do and we will always give you the credit – where it is due. Thanks for the point, it’s a good one. I had nothing to do with the making or designing of this and can’t take any credit. I guess there’s a spectrum here, with this at one end and something like the cufflinks I designed from scratch at the other. In between are things like the trench coat and polo shirts where I am building on the work of others – often tweaking, but never producing from nothing. Speaking of which… Do you know when the short sleeve polo will be back in stock? The side fastener, do you source your own? Or do you go with whatever the tailor supplies? If the former, which retailer do you use? Ps would I be correct in assuming that a side fastener is more formal than a belt? Yes, it is generally seen as more formal, because the fronts are cleaner and neater. Nice pictures clicked above and perfect dressing style. I usually don’t like the cream colour but the above fabric is looking beautiful and the price is not that expensive according to the quality of the product. Simon on the colour which seems to have got the most attention in the comments whats your opinion of wearing cream more generally? 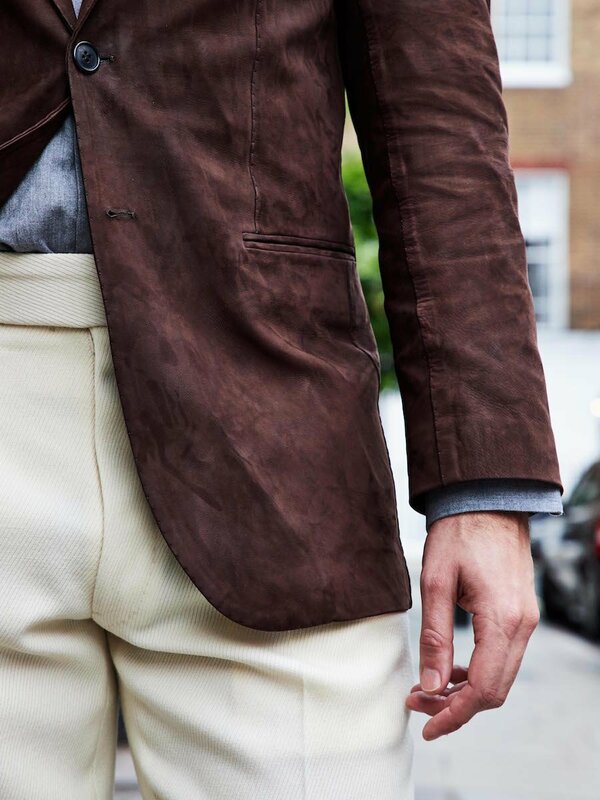 Cream linen suits come to mind in the Summer. Is it a nightmare in terms of maintenance? Do your clothes require frequent cleaning. Be interested to hear your experience. If these trousers got badly stained, do you think it would be possible to have them dyed to a darker colour? I’ve no idea to be honest. Do you know anyone that does garment dying? Yes, there are a few traditional ‘teinturerie’ in Paris (you have to pay attention because some normal dry-cleaners also call themselves ‘teinturerie’). I have seen really excellent results on stained cotton clothes, just wondering if it could work as well for wool. It would be interesting to try out, and definitely an incentive to invest in clothes in more ‘unpractical’ colours. Thanks anyway! Good to know, thanks. At the least, I’d want to experiment with something I cared less about – or perhaps something that wasn’t going to be worn in its current state, so there’s nothing to lose. I am thinking about commissioning a pair of cavalry twill trousers but are a little bit worried about the “sheen” of the cloth. I am afraid that it is not muted enough to work in a casual outfit. What is your opinion?